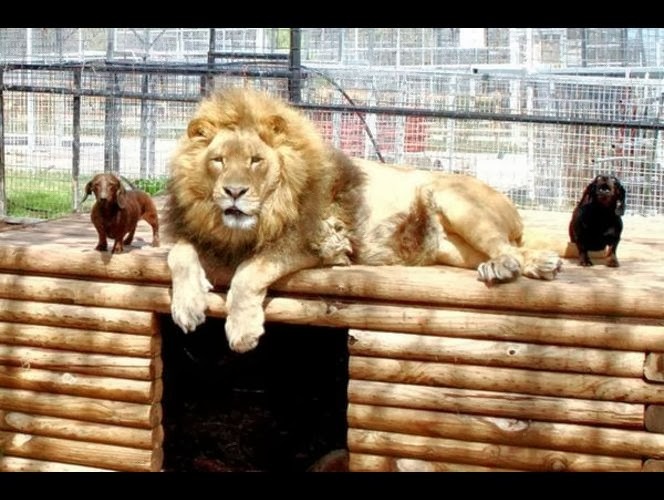 The other day Charlie somehow stumbled across an online article about a lion and a pack of Dachshunds that are BFF at an exotic animal park in Wynnewood, Oklahoma. 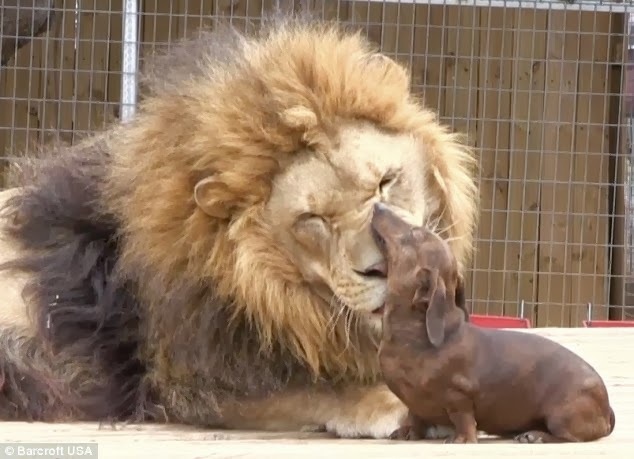 I was at first appalled for the obvious reason that an itty bitty wiener dog would probably look like a delicious afternoon snack for a ferocious beast like a lion. So I said, "That is insanity! I would NEVER put my babies in a pen with a LION!" *Bonedigger (the lion) was born with a metabolic bone disease that has rendered him mildly disabled. 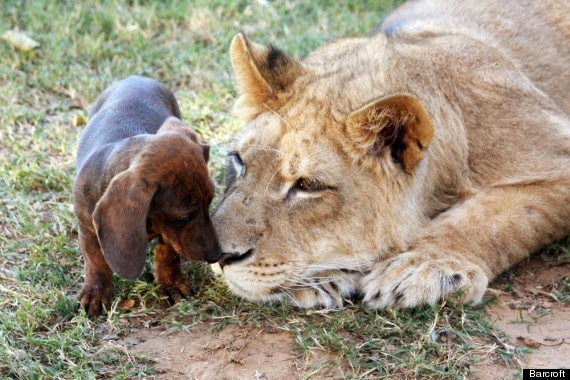 *Milo (the Dachshund) and his litter mates were first introduced to Bonedigger when he was just a four week old cub. They have been inseparable ever since. *Milo, for whatever reason, seems to have formed the tightest bond with the now 500 pound Bonedigger and even licks his ginormous teeth clean for him. 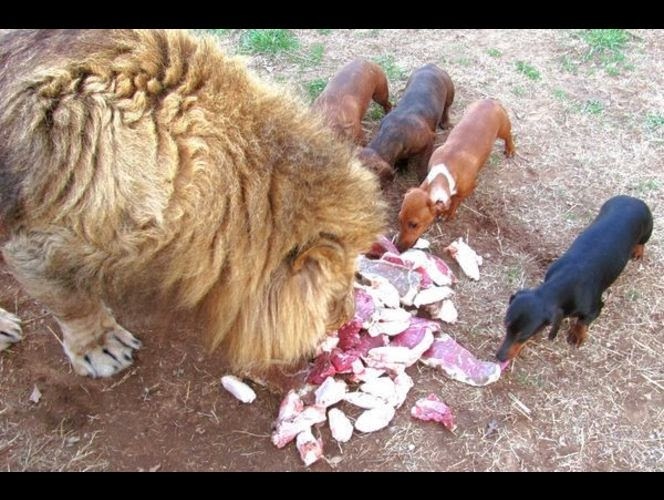 *They all break bread munch on raw meat together. Yum-yum. * Don't nobody mess with Bonedigger's homies for this maketh for a very angry lion. * The Dachsies sleep on his back. * Milo has apparently learned to speak Bonedigger's lion language and imitates his puffing which is some sort of growl they use to communicate with other prides. I knew Dachshunds were smart but color me impressed. Unlikely friendships are often the best kind. Or at the very least, the most fascinating. 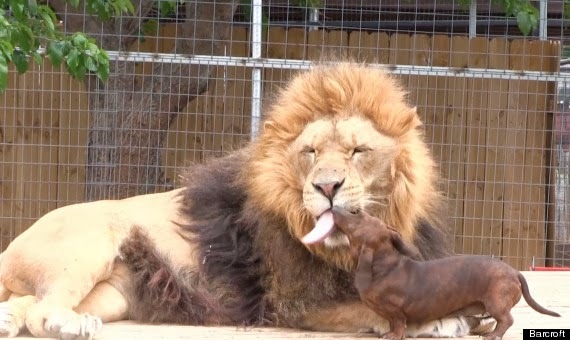 But I still don't think I'd trust a lion around my wieners. No way! Lions are called wild animals for a reason!! Have You Tried Stitch Fix?